With coral reef health in Belize rapidly declining, several environmentalist have started initiatives to prevent the total loss of this valuable marine ecosystem and tourism attraction. One such initiative is called Fragments of Hope, and it aims to re-seed devastated reefs with genetically robust, diverse and resilient corals farmed in man-made nurseries. 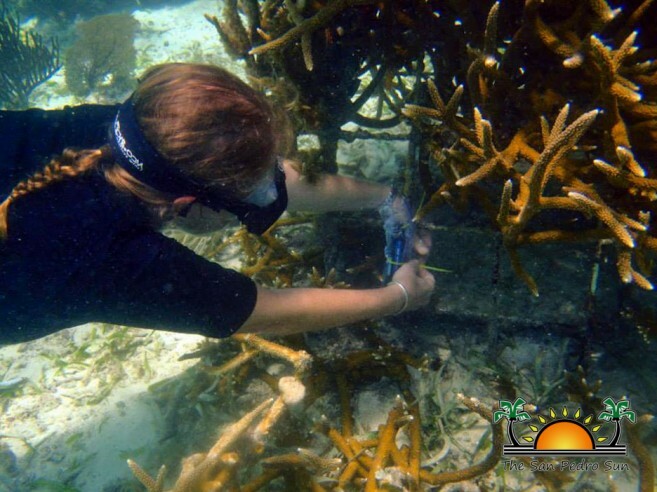 Marine Biologist Lisa Carne has been at the forefront of Fragments of Hope for the past eight years, slowly restoring the reef system at Laughing Bird Caye in the Stann Creek District. 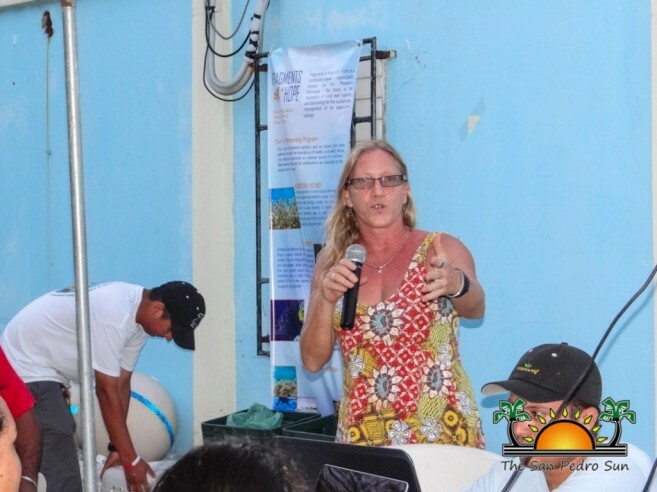 Due to her vast knowledge on coral nurseries, Hol Chan Marine Reserve invited Carne to give a special seminar as part of the 10th Annual Reef Week. 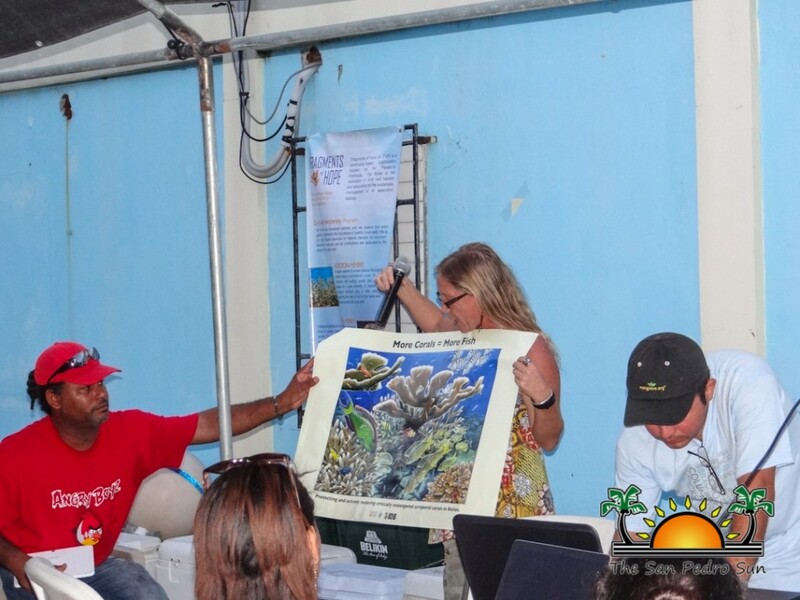 Held on Thursday, May 14th at the Hol Chan Marine Reserve Officer, the seminar saw the attendance of several tour operators as well as concerned citizens. Prior to Carne’s presentation, Hol Chan Manager Miguel Alamilla took time to discuss issues regarding Mexico Rocks. Among those issues was the installation of mooring buoys that will be necessary to accommodate vessels visiting the area. After the short discussion, Carne started the presentation by explaining the work being done by Fragments of Hope. 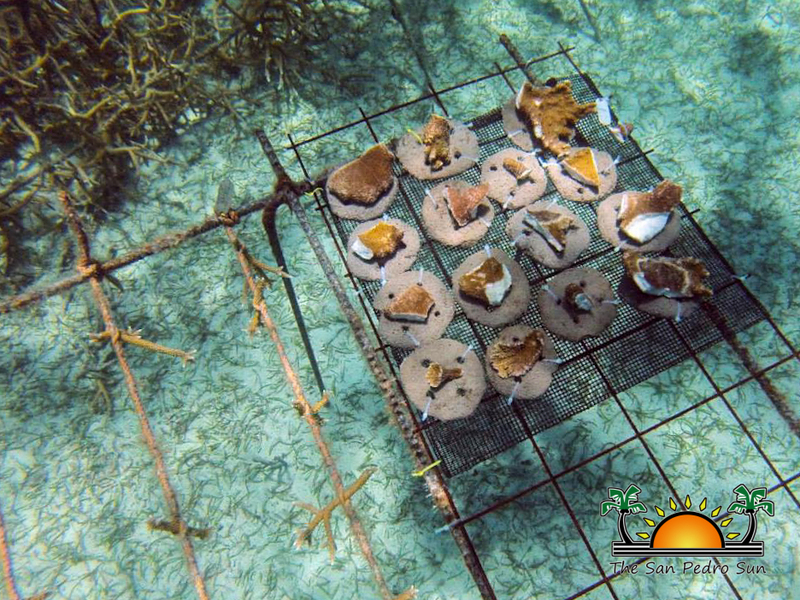 “We have been developing coral nurseries in Laughing Bird Caye for over eight years. Coral nurseries is practiced across the world and is a viable way to restore ecosystem functions of the reef (storm protection, fisheries habitat, aesthetic value for tourism) by out-planting corals with known bleaching history, and genetic information on both the coral host and its symbiotic algae clade (chlorophytes). To date over 11,000 fragments have been planted at Laughing Bird Caye National Park,” said Carne. Carne explained some of the threats that affect corals include pollution, over-fishing, sedimentation, global warming and other local human impacts. “Elevated sea temperatures have caused widespread bleaching and disease outbreaks, contributing to massive mortality. In 2006 the Caribbean acroporids (Elkhorn and Staghorn) were the first corals to be listed on the IUCN Red List; their status is Critically Endangered, one step away from extinct in the wild. 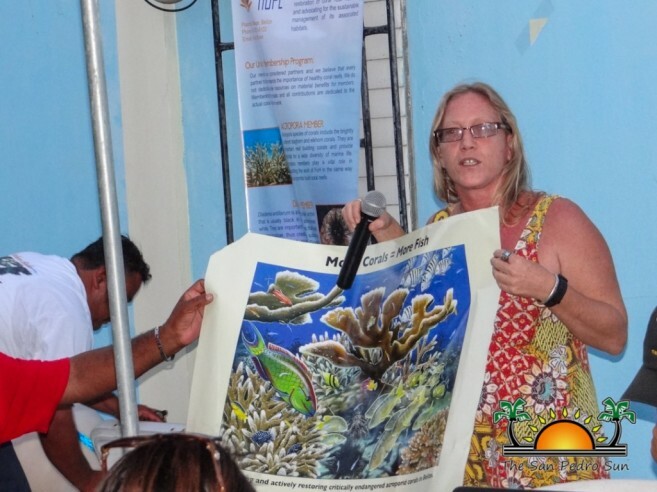 These corals were formerly the most common in the Caribbean but their abundance has declined significantly in the last 30 years,” said Carne. Through Fragments of Hope, Carne creates hybrid corals that are more resilient to these threats. Since these corals have adapted to high wave action and storms, broken fragments can create new colonies if they are stabilized. Since 2006, Fragments of Hope has been taking advantage of this phenomenon by affixing loose fragments back to the reef with cement and/or cable ties after storms or ship groundings have broken up corals. As of 2009, 15 coral nurseries have been established in Belize. “The focus is on the Acroporidae because of their endangered status and rapid growth rates, they can produce over 300% of their original mass in just a year using three different artificial substrates: ropes, metal frames and cement discs on tables. 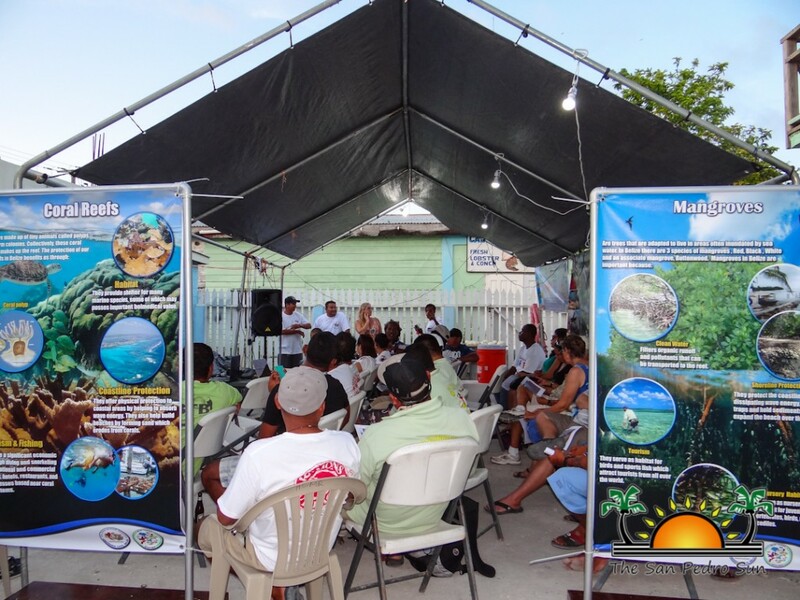 While similar restoration efforts are occurring in places like Honduras, Jamaica, Puerto Rico, the Florida Keys and the Dominica Republic with the aim of re-seeding reefs, only in Belize has the primary focus been on climate change adaptation by identifying corals with the most resistance to bleaching and disease. Both the coral host (animal) and their tiny symbiotic algae clades that live within the coral tissues have been genetically characterized (23 genotypes of corals to date) in an effort to understand why some corals are more resistant and/or resilient to bleaching and disease,” said Carne. Due to its protection status, Laughing Bird Caye National Park is Belize’s first true reef restoration site. 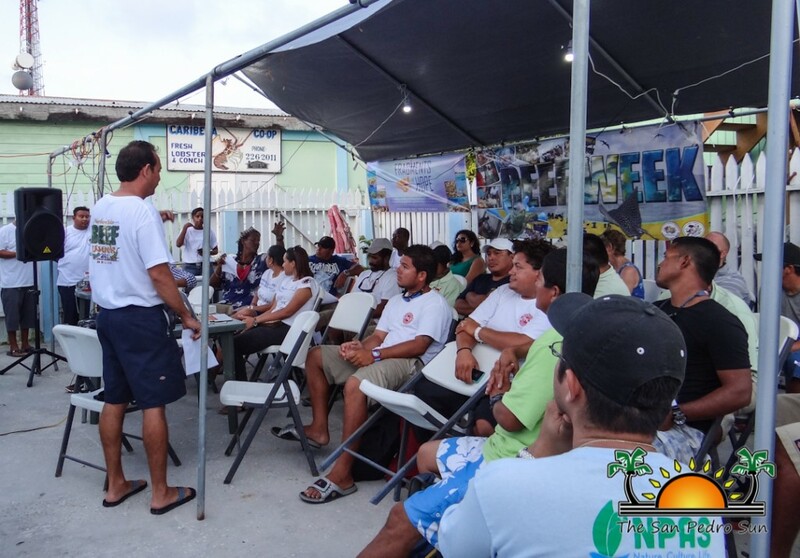 To date, over 17,000 coral fragments have been planted with the support of local tour guides, the Belize Fisheries Department and local Non-government Organizations. “True reef restoration includes more than just the Acroporids, so eight other coral species are included in the nurseries for future out-planting, some of them much slower growers. Currently, some researchers are lobbying to include another 12 Caribbean coral species on the IUCN Red List, so the time is now to experiment with growing and re-planting these corals. Growing and replanting corals represents a hands-on adaptive strategy for stakeholders like marine tour guides, marine reserve staff and trained volunteers. In Belize we are taking steps to ensure that we are propagating not only multiple genotypes, but also the strongest and fittest specimens,” said Carne. At the end of her presentation those in attendance took the opportunity to ask questions and offered tips on how to better the coral nurseries. Hol Chan thanks Lisa Carne for taking the time to present Fragments of Hope to stakeholders. Reef Week activities also included a Coastal Cleanup Campaign on the turtle nesting beach at Bacalar Chico Marine Reserve. Youth volunteers joined the Hol Chan staff in cleaning the beach area that sees a lot of garbage washing up on its shores. 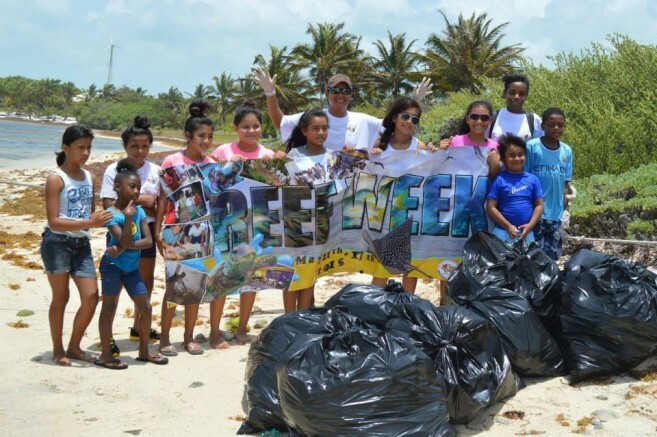 Hol Chan would like to thank all those who took the time to participate in the cleanup campaign and urges everyone to not litter, whether on land or in the sea.